Messages are now being sent to Candlesacape, our globe-based online message board, from Japan and all around the world. When you post your message on Candlescape, a drop of light appears at that point on the globe. Drops of lights are now found in some places of Europe, Asia and even Antarctica. A message was sent from Japanese Antarctic Syowa Station. Currently, the 50th Japanese Antarctic Research Expedition team is staying at the station. As a special commemoration at the Mid-Winter Festival, an event is planned to observe the aurora while the lights are off. This event will correspond with the Japanese Candle Night Summer Solstice. In Japan, it will be 8 p.m. to 10 p.m. on June 21 and in Antarctica it will be 2 p.m. to 4 p.m. where they will turn off their room lights and spend the time under dim LED lights. They have to use LED lights because the winter weather of Antarctica is too dry to use fire and candles. On Antarctica, at 2 p.m. in the afternoon, it is totally dark outside. At the Syowa Station, observation of the aurora is not for its beauty but for the study of earth science. At the station, they are careful not to affect the aurora by preventing light from shining outside. Spending the same time under common conditions will give people a chance to connect with each other. The members of the Syowa Station team may think about their families left behind in Japan. At the same time, all of us can feel connected to people in Antarctica during mid-winter. Spending Candle Night at the same time as others on the opposite side of the world may reassure us that we are not alone, and we are connected to people around us. It was slightly cloudy with some sun, but the wind blew strong in the morning, more than 10 meters per second. If the weather conditions were better, each person would have lit an ice candle. The start was delayed until 4 p.m. and held at the central area of the station. Even though the weather was harsh, freezing temperatures of 15 degrees below zero Celsius with strong winds, the captain of the 50th Japanese Antarctic Research Expedition team and chief of the camp lit candles on behalf of the expedition team, thinking of their family members in Japan. A member of the team, Hiroshi Tatsumi said: "The Candle Night event reminded us of how severe the nature of Antarctica is. With strong winds, it was really freezing. Even five minutes outside may have frozen my fingers and toes. Antarctica, where we are stationed, shows us the great beauty of nature. At the same time, according to the weather, it turns into a severe environment. It also shows us how human beings are small and weak. The Candle Night event on the winter solstice there was like what Antarctica really is. 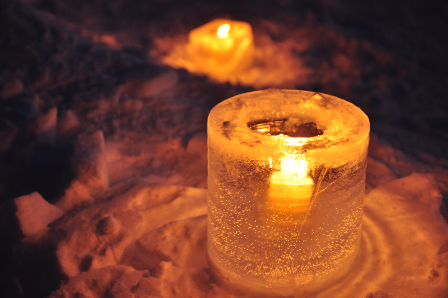 The lights of ice candles appeared in the darkness of the polar night. The small and warm lights of candles will continue to shed light on the hearts of members at the Syowa Station.